Energizing Brain Breaks are quick 1-2 minute activities for your classroom or audience. They take virtually no preparation and no extra materials to perform. Students and audiences of all ages love them. Why do they love them? Because they are fun and make you laugh. They also challenge your brain. Energizing Brain Breaks help you to cross the mid-line of your body which helps both sides of your brain engage. It is suggested to use an Energizing Brain Break every 30 minutes with your class or audience. You can imagine a class of students sitting most of the day. Energizing Brain Breaks help student to stand up and be active every 30 minutes. 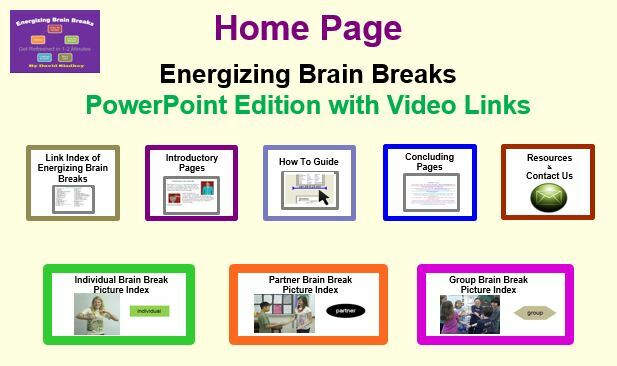 The Energizing Brain Breaks Blog started in 2008 and contains many videos of students performing Energizing Bran Breaks. If you are interested in seeing Energizing Brain Break in action go to this blog entry called GOTCHA click here. Or you could see the Finger Tips Brain Break click here. The Energizing Brain Breaks Book is available by clicking here. It has 50 activities inside. It has color cardstock pages with a laminated cover and is spiral bound. It has easy step by step instructions for you to pick up the book and use at anytime. There are no extra materials and no prep time. If you would like to see some sample pages from the book then click here. The digital versions of the book are available as well as the 50 activities in video form when you purchase the book. There is a password protected companion website that will be listed in the book that will guide you through how to get these valuable resources. 40% of the author's profits of the Energizing Brain Breaks Book are donated to the Organization called Rise International. Rise helps to build schools in Angola Africa. The majority of student age children do not get to attend schools in Angola because there are NO SCHOOLS available to them. The country is still recovering from 27 years of Civil War. Rise has helped build more than 100 school in the 7 years of it's existence. 10% of the author's profits go towards the Naperville Education Foundation.